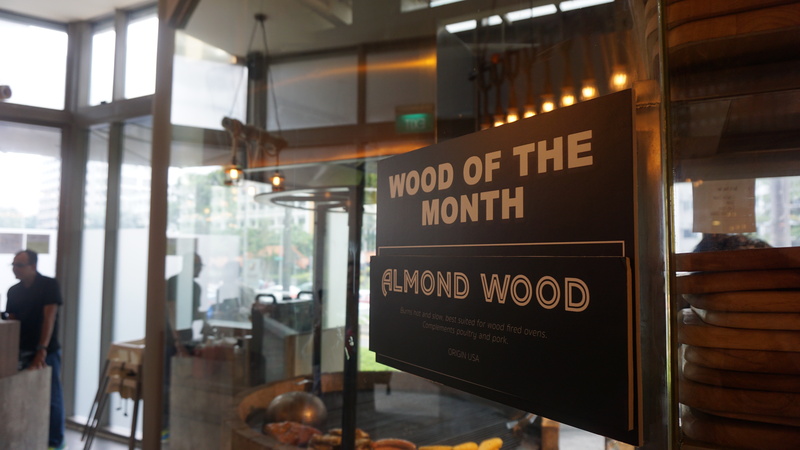 Hougang One is certainly bucking the mall trend with some seriously differentiated F&B offerings. 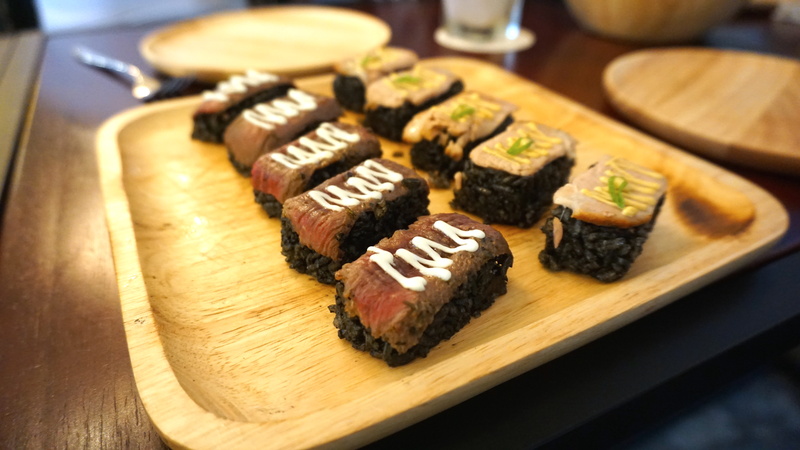 When I dropped by for my tasting, I was surprised to see that Far East was taking such an experimental slant to HDB Heartland dining, with offerings like Thai Super Bowl, and today’s focus of the day: Meat Market. Everyone knows that I love a good steak, but I think there’s some real value in digging into well-smoked meats. First off, smoked meats are usually cooked low and slow, so they’re generally moister and more tender. I also like the idea of a nice solid char when the pitmasters finish over high heat grilling. Of course, the aroma of the wood matters the most, and I loved how Meat Market played that up to the max. When I went, they were using Almond Wood, and it is a good thing that they will rotate woods on a regular basis. I think we still lack education about techniques and ingredients so I do think that rotating wood that will subtly change the flavours of the same dishes will expose diners with a wider range of flavours, even if they order the same thing repeatedly. We started our meal with an assortment of items that yo’d usually find in a cafe. While that did sound a little off beat for a grilled meat focused place, it wasn’t bad at all. 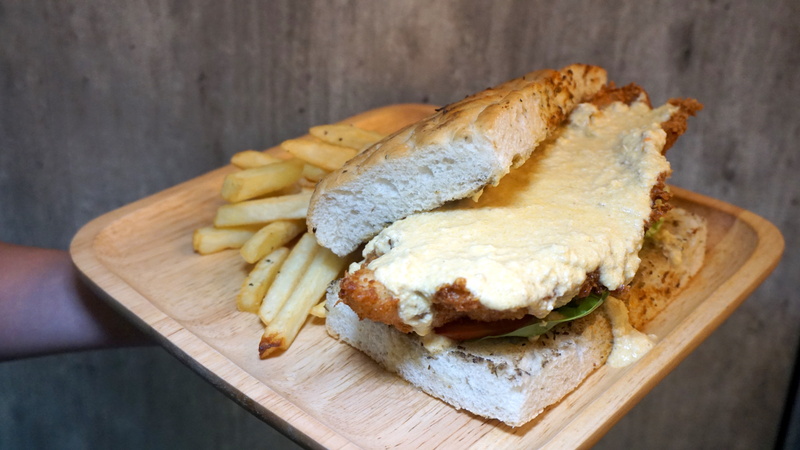 Have a look at this huge slab of fish on a crispy bed of focaccia bread, and you’ll know why the Salted Egg Fried Fish Focaccia ($12.90) is such a treat. For starters, the huge piece of dory fish is firm to the bite, and fresh. This is particularly important to me because it is common knowledge that many places fry their fish only when it isn’t as fresh. 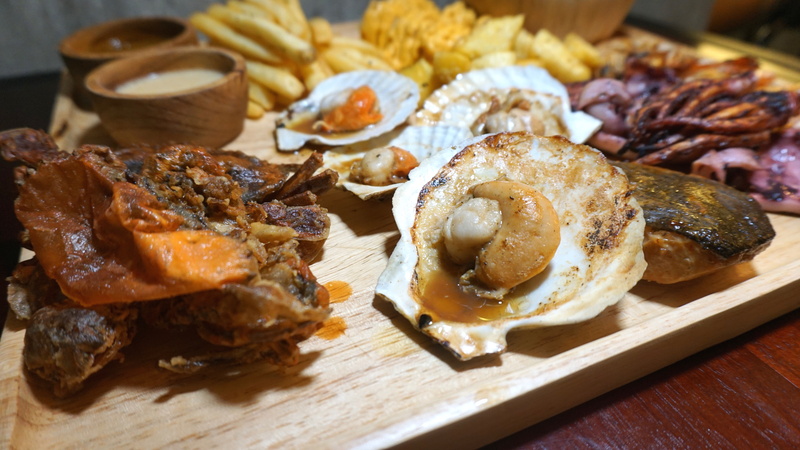 The salted egg sauce that hugs the fish is serviceable, but I would have preferred it at the side so that I could control the amount I was consuming. The Black Nigiri ($10.90 -5 pieces, $18.90 – 10 pieces) was the weaker of the 3 opening items we had. The beef slices here needed to be thicker, and the rice was falling apart as I picked mine up to eat it. I think a better grasp of the production process, and a slightly more generous piece of beef would justify the $10.50 price tag. 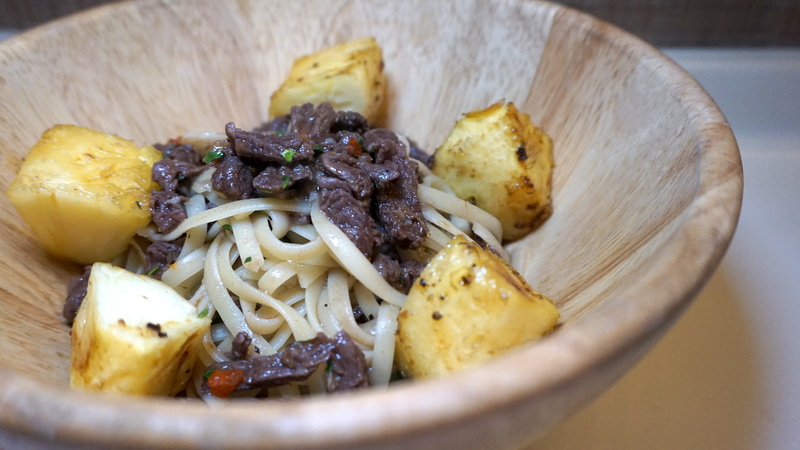 The Thai Beef Aglio ($12.90) is a completely different story in my opinion. It’s a great dish, leaning on the sweeter influences of Thai cuisine to deliver much needed flavour to the beef. 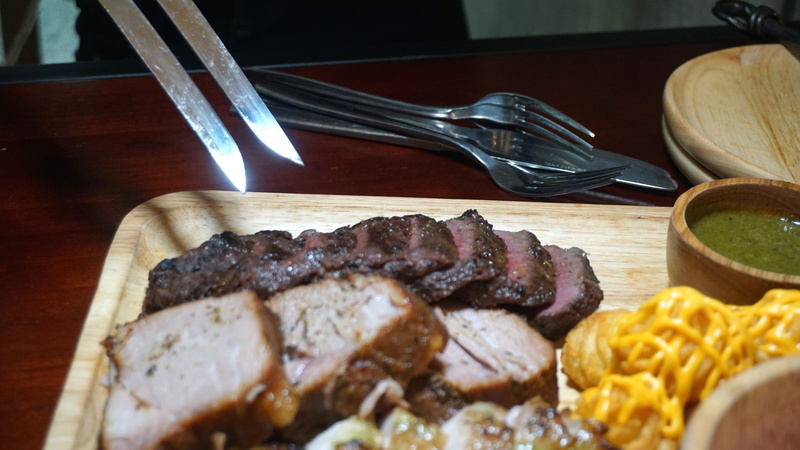 As a counterbalance, the pineapple provides some much needed acidity to cut through the sweetness of the beef marinade to prevent the dish from getting too heavy. 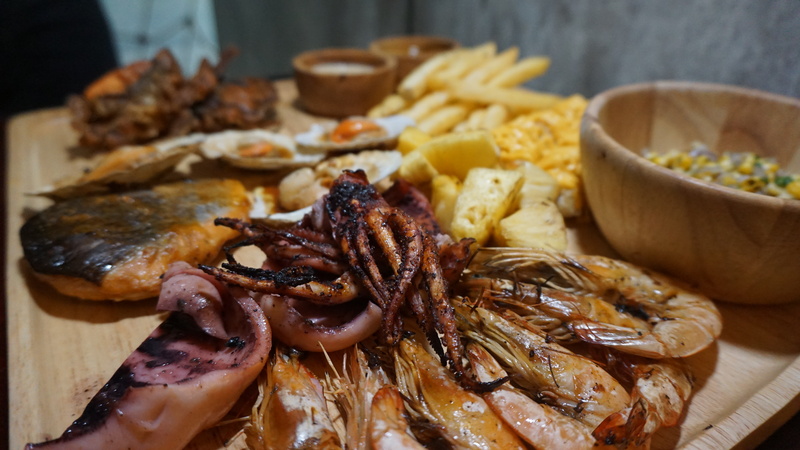 The highlight of the meal is, of course, the platters of meat and seafood that spent time on the almond wood-fired grill. You could choose to build you platter, but for our hosts had kindly chosen some of more popular options for us. 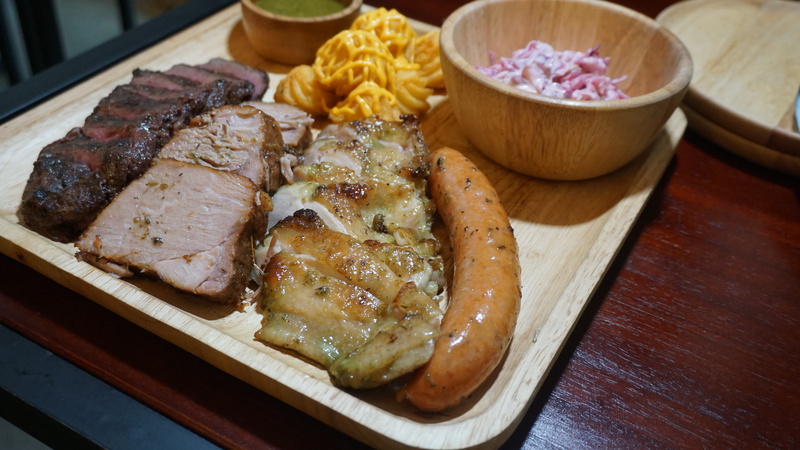 This Carnivore Platter ($29.90) will satisfy the tongues and tummies of most carnivores. 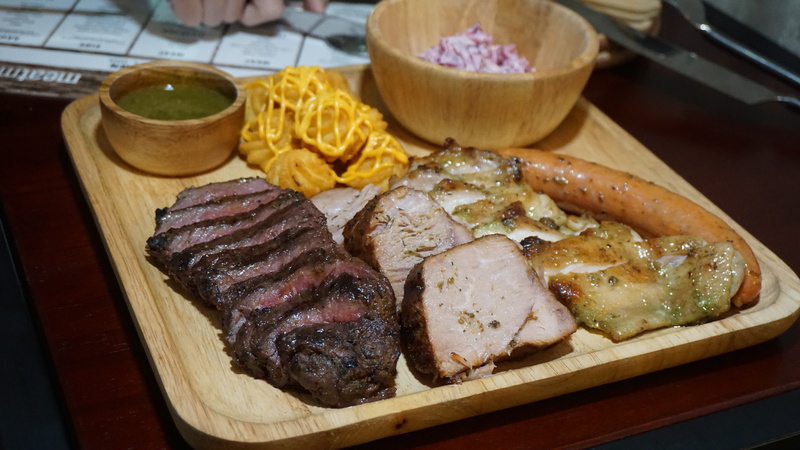 An assortment of tenderloin, chicken, pork collar and sausage is augmented by a choice of 2 sides and a sauce. I found the chicken and tenderloin to be juicy and flavourful enough, while I thought that the pork collar needed a bit more work. It was dry, and I found it hard to eat. Other than that, this platter made me happy! The Fisherman’s Pride ($45.90) is a little more of a mixed bag for me. I was impressed with the perfectly cooked salmon. It wasn’t dry at all and the flavour was perfect. The scallops were a little too flavourful for me, and I think they could do better with fewer, but larger prawns. On a positive note, I loved the soft shell crab, and was happy to devour what my dining compatriots left for me! Meat Market is still a little rough around the edges, but it’s got the right direction and hits the right notes when it counts the most. The grill is just nice, and there’s a good variety of meats on the grill. The price point is perfect for the heartland carnivore, and the idea of swopping out wood every so often works in their favour to bring people back. What they need is a little more control in the kitchen when it comes to the cooking of some of the meats, and I think they’ll be packing in the crowds!